Day two of dressage at the 2014 Alltech FEI World Equestrian Games dawned with a familiar set up. The team from Germany always sets the gold standard in international competition, and they were the unsurprising leaders after day one. The Dutch team also assumed their usual spot as a top contender with the second position. But nearly all the way at the end of the start list was the young British rider and the Dutch Warmblood gelding who could upset the status quo. Charlotte Dujardin and the great Valegro led their country to an unprecedented victory at the 2012 Olympic Games. Could they do it again at the WEG? The day started with the rider perhaps most responsible for Germany’s success in modern dressage competition. Isabell Werth has five Olympic and seven WEG gold medals in her impressive hardware collection. She came to Normandy with a lovely chestnut mare named Bella Rose 2, a relative youngster at just 10 years old. If she felt any pressure performing in d’Ornano Stadium, she didn’t show it. Performing a nearly flawless test with impressive piaffe work, Werth and Bella Rose finished with a new high score of 81.529. Laura Graves was the first American to ride in Tuesday’s competition with her 12-year-old gelding Verdades. Verdades appeared a bit distracted by the atmosphere in the stadium at times, but Graves skillfully channeled his energy into a solid test. The pair earned a 74.871 in their WEG debut, good enough to just make the top ten at the end of this round. The final rider for the U.S. was Steffen Peters, the team’s most experienced international competitor who brought home bronze from the 2010 WEG with the great Ravel. His current top mount is the reigning U.S. champion Legolas 92, a 12-year-old Westphalian gelding. The American team had a shot at the podium, but it would have required a flawless ride from Peters. While the pair did turn in a bold, accurate test, it was marred by major mistakes in the one tempis. Still, a score of 75.843 put Peters in eighth place individually and kept the U.S. team in fourth place. 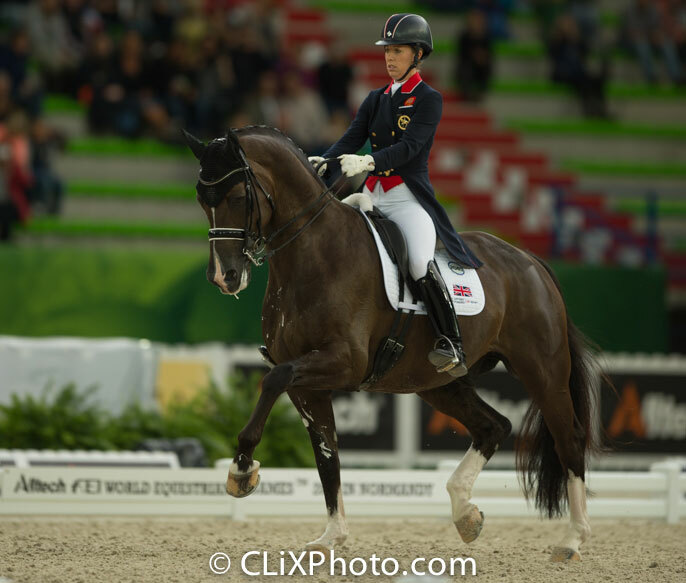 There was almost no question that Charlotte Dujardin and Valegro would be a contender for the top of the leaderboard. The real question was how big their score would be. They needed 81.33 or better to bring the British team to silver. They did not disappoint, scoring 10s from the judges for the extended trot, tempis and piaffe, among others. They truly made it look easy, walking away with an 85.271 to secure the top spot on the leaderboard individually and the silver medal for their team. At the end of the day, the Germans took home team gold with Great Britain taking silver. The Dutch team rounded out the medals with the bronze. This afternoon, the German team announced that Werth and Bella Rose would not continue on in the competition. Bella Rose showed signs of lameness after her performance due to a hoof inflammation. Dressage competition continues with the Grand Prix Special on Wednesday, Aug. 27. Sounds like a fun and intense competition. So wish I could watch it.